Whether you watched the State of the Union address by President Trump last week or not, you, like me, probably have no illusions that the two parties will accomplish much together in the foreseeable future. One area where they reportedly have common ground is infrastructure repair and maintenance. The numbers certainly argue for a new spending bill, but the need for common sense spending, and what Washington actually does with our tax dollars, don’t necessarily line up these days. The American Society of Civil Engineers (ASCE) compiles an extensive report on the state of the infrastructure in the U.S., looking at roads, bridges, waterways, schools, airports, and a variety of other key infrastructure indicators. The news is not good, and hasn’t been for years. The total amount of infrastructure is massive, and much of it has not gotten needed attention for repair and maintenance. ASCE issues a “report card” every four years for the overall infrastructure, and as of 2017 the grade was a D+. It was the same in 2013. The report details crumbling roads and bridges, inadequate school facilities, and airports and air traffic control systems that have failed to keep pace with an increasing number of aircraft and air travellers across the U.S. Dams are ever closer to failing, and our ports, which handle approximately 26% of all goods flowing through the U.S. economy, need deeper channels to handle larger ships, and new equipment landside to load and offload these new larger vessels. 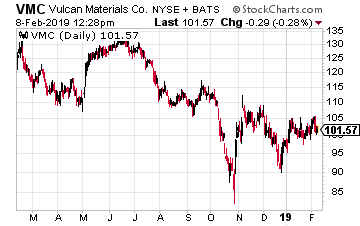 So, if I look at infrastructure companies, ones that provide the material and logistics to build new roads, bridges and airports, I might expect to find a graveyard of broken stocks. But that’s simply not the case. Why? Three factors are driving infrastructure spend, which, according to the companies selling the cement and asphalt, is getting increasingly stronger. First, we actually do have an infrastructure bill in place in the U.S already. The Fixing America’s Surface Transportation (FAST) Act was signed into law by President Obama in December 2015, and provides for over $305 billion of dedicated funding for U.S. infrastructure. The five year budget, running through 2020, is still being spent and driving business for infrastructure companies. Second, a strong economy the last few years, as measured by unemployment numbers and jobs created, has meant more money for state coffers. State Departments of Transportation across the U.S. are starting to pick up the slack from federal funding and fix their infrastructure themselves. It appears this funding is in the early stages, with many states recently engaging in large long term projects. And third, the companies I look at below, are working in states where the population is growing. This means more building as residents move in, more tax revenue, and then more infrastructure building. According to the latest U.S. census numbers the highest growth states include the Carolinas at 9 and 10, Texas at 8, Colorado at 7, and Florida at 5. Not surprisingly, these states represent the backyard of the infrastructure companies doing well. Let’s not hold you in suspense any longer, and get to the companies. Maybe my mention of Martin Marietta stirs your memory of the aerospace and electronics company it once was. When Martin Marietta merged with Lockheed in 1995, the companies formed Lockheed Martin (NYSE: LMT). But the new aerospace and defense company had no need for a provider of cement and concrete, and spun off Martin Marietta Materials the following year. Today, Martin Marietta provides aggregates and heavy building materials. They sell the material necessary to build roads, sidewalks and the foundations of homes and commercial buildings. And they’re doing a good job of it. The company has taken advantage of a strong economy in the U.S. and grown earnings an average of 31% the past 5 years. Operating in growing states such as Texas, North Carolina, Georgia and Florida, Martin Marietta is seeing an acceleration in public contracts let by the Departments of Transportation in these states. The company has made a focus on demographic trends a mainstay of their business strategy, and they are following the time tested tactic of going where the money is. As CEO C. Howard Nye, who has been CEO since 2010 recently stated, “In fact, many of our most attractive areas, while growing, are still well below mid-cycle shipment levels. Further, it remains difficult to see an end to this recovery when the long-awaited arrival of increased infrastructure activity has only recently begun in earnest.” It doesn’t get much rosier than that. Not only is the company seeing an uptick in business, they are raising prices at the same time. This is one of the reasons to get in the stock now. 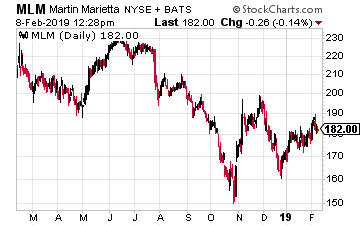 As Mr. Nye puts it, “Our optimism is further bolstered by favorable pricing trends, typically an indicator of underlying market strength.” Martin Marietta is projected to grow earnings per share next year 16.5%. Finally, the company should benefit from unfavorable weather which adversely impacted the Carolinas last year in the form of Hurricane Florence. Causing an estimated $18 billion in damage to the Carolinas, the region will have to go through a long period of rebuilding damaged infrastructure. This rebuilding process generally takes several years, and results in an increased demand for the products Martin Marietta provides. A second supplier of building materials which should benefit from the same tailwinds as MLM, is Vulcan Materials. Echoing comments from Martin Marietta, Vulcan Materials CEO, J. Thomas Hill noted about their third quarter, which was marred by the inclement weather mentioned above, “Highway construction demand is strengthening across the country, but much more so in our markets. Supporting my thesis here, Mr. Hill added, “Prices continue to escalate. With improved flow-throughs, all of which is supported by growing demand.” And Vulcan isn’t content with just growing organically, they’re making acquisitions, something I like in an expanding market. In 2018 the company bought Aggregates USA, a materials provider with operations in Georgia, South Carolina, and Florida. As Mr. Hill points out, the acquisition “adds to our product offering, expands our distribution network and service areas, and will help us better serve our customers.” Any merger kinks should be worked out by now, one year later. Vulcan has grown earnings per share almost 49% per year on average the past 5 years, and is projected to grow earnings at a 24% clip next year. The company currently trades at a PE of 32, but that should drop to around 21 if earnings come in as projected. 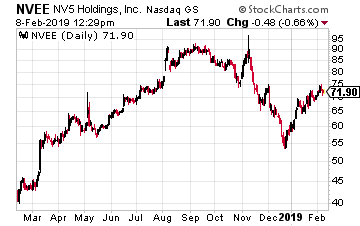 If you’re looking for a smaller company, that has exposure to U.S. infrastructure, but has exposure to growth from infrastructure projects globally, look no further than NV5 Holdings. The company provides a wide array of technical services related to building projects, including providing water and electricity to buildings, and providing logistics services for waste water management. NV5 is an innovative company looking for new ways to provide value to its customers at lower cost. You know I like companies that not only develop technology, but apply new technology and develop business models using emerging tech. A great example of this is the drone survey business, a quickly growing sector for construction, as well as safety and inspections. NV5, like Vulcan, is also acquiring companies and adding additional services to its lineup. The company recently acquired CHI Engineering, which gives it access to a client base of over 80% of the 140 Liquified Natural Gas (LNG) facilities in the U.S.
NV5 has extensive business globally, and importantly operates over a range of sectors within the building industry. The company is currently working on projects in Abu Dhabi, Cypress, Macau, Hong Kong, China and Taiwan. And, customers range from municipalities, to transportation hubs, to multinational hospitality companies. NV5 has grown earnings an average of 34% over the past 5 years, and is projected to grow earnings over 80% this year. The company has a very small amount of debt, and trades at a PE of just over 26. New infrastructure bill in the U.S. or not, federal funds are flowing and states are ponying up to fix their crumbling infrastructure. And, even with growth slowing internationally, new building projects are still being captured by innovative companies. Take a look at Martin Marietta, Vulcan Materials, or NV5, they may be just the foundation your portfolio needs.